Candid Unheard Voice of Indian Microfinance: Deutsche Bank’s Investments in Micro-Finance Institutions (MFIs): In Tune With Its Own Global Micro-Finance Strategy? Deutsche Bank’s Investments in Micro-Finance Institutions (MFIs): In Tune With Its Own Global Micro-Finance Strategy? Folks, the last few weeks have indeed been a revelation on how investors operate in the international supply chain of micro-financing. Courtesy Hugh Sinclair and his controversial book, we have received a lot of insight into the functioning of MIVs and other investor(s) like Deutsche Bank. “Deutsche Bank has recently acquired 9.15% of the shares of Indian MFI SKS, which is a bank I question substantially in the book. It would be hard to defend any claim that Deutsche Bank were unaware of the claims about SKS given the adverse publicity the institution has received. Criticism involves the IPO process and personal enrichment of a few individuals and private investors; abusive debt-collection practices, leading to explicit mention in the SERP report regarding client suicides; and most recently, “massive problems” with their life insurance practices, amongst other criticisms. Deutsche presumably found such factors compatible with their ethical practices. Therefore, I believe that there are genuine concerns about the role of Deutsche Bank in the battle to reduce poverty. I believe there are valid reasons to support the case that their due diligence is not as thorough as it could be. I believe there are fundamental contradictions between the claims made in the SMART Campaign (which Deutsche Bank endorse and support financially) and Deutsche Bank‘s subsequent actions. I believe that the MIVs are largely (not entirely) responsible for a significant part of the adverse activities of some of the less scrupulous MFIs globally, not simply in India, by providing fuel for the fire and turning convenient blind eyes when it suits them. What is increasingly convincing me that, what Hugh Sinclair has been saying may indeed be a “correct” representation of reality as far as investors like Deutsche Bank are concerned, is the recent investment by Deutsche Securities Mauritius Limited in SKS Micro-finance Ltd, India’s only listed micro-lender. The investment that I am referring to is the purchase of shares worth Rs. 779 Million (US[ii] $ 13.90 Million) by Deutsche Securities Mauritius Limited in SKS Microfinance. 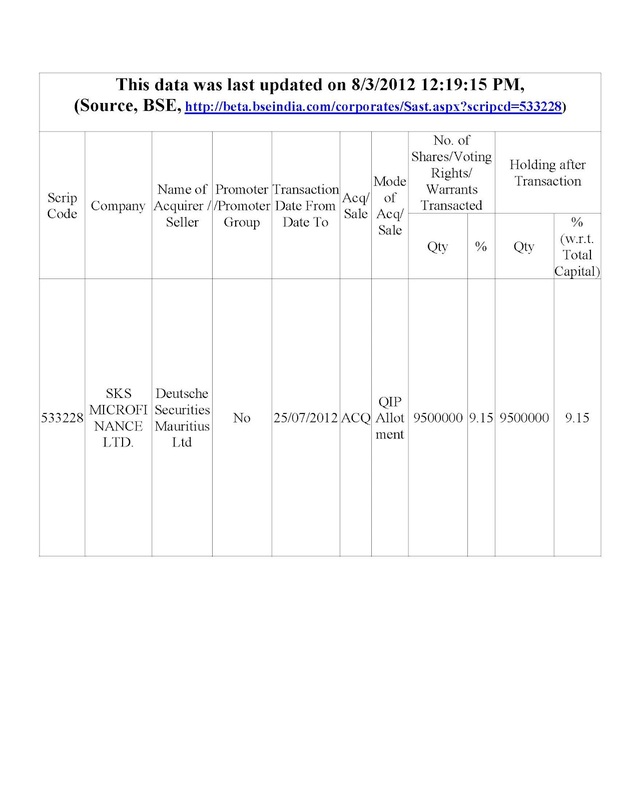 As the Bombay Stock Exchange (BSE) lists under “Disclosures under SEBI (Substantial Acquisition of Shares and Takeovers) Regulations, 2011” (http://beta.bseindia.com/corporates/Sast.aspx?scripcd=533228), it is indeed true that Deutsche Securities Mauritius Ltd acquired (on 25th July 2012) through a QIP allotment, 9.5 Million Shares in SKS Microfinance Limited. 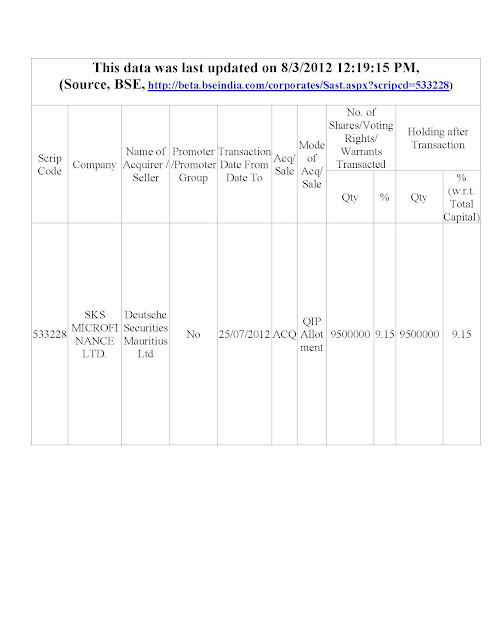 The original table from the BSE site is reproduced below. Now, what do we know about Deutsche Securities Mauritius Limited? According to available secondary data in the internet[iv], Deutsche Securities Mauritius Limited, is incorporated in Mauritius with Registration No. INMUFD175508 valid up to 06 - JAN – 2014. According to other information available across the internet[v], Deutsche Securities Mauritius Limited is said to operate as a subsidiary of a Singapore based company called Deutsche Asia Pacific Holdings Pte Ltd.
Deutsche Asia Pacific Holdings Pte Ltd, as a company, is said to engage in financial futures, options broking, stock broking, foreign exchange trading, and provision of related financial advisory services. Deutsche Asia Pacific Holdings Pte Ltd is said to have been formerly known by the name – ‘Deutsche Morgan Grenfell Asia Pacific Holdings Pte Ltd’. Therefore, it is clear that the purchase of shares - of SKS Microfinance Limited - was done by one the key subsidiaries of Deutsche Bank AG. Therefore, this investment can certainty be called as an investment made by Deutsche Bank AG or the Deutsche Bank group. Okay folks, what are the key issues concerning this investment made by Deutsche Bank? Read the following news items and it will become clearer. “’We have found massive problems in insurance operations of SKS Microfinance’, Mr J. Hari Narayan, Chairman, Insurance Regulatory and Development Authority, told Business Line. IRDA teams conducted field enquires and inspections for a long time, he said. The irregularities included receiving the cheques of death claims from its insurers on its name, which is illegal. The only listed MFI in the country, based out of Hyderabad, had also ‘collected’ higher commissions than permitted by the insurance regulator while selling the insurance policies”. I am not sure that anyone would invest in a company that has been directly accused (of having massive problems in their insurance operations) by no less a person than the Chairman of a major regulatory authority covering insurance operations in India. And for the record, Mr. J. Hari Narayan, Chairman, Insurance Regulatory and Development Authority (IRDA), is a very well respected (professional) regulator. That apart, investing in a company that self-admits increasing ghost clients and frauds[viii] in its operations is again a very serious matter. “Deutsche Bank was the first global bank to establish a socially motivated microfinance fund more than a decade ago. Our activities in the microfinance sector are led by the Community Development Finance Group as part of the Bank's overall Corporate Social Responsibility commitment. We provide loans, investments and limited philanthropic grants to the microfinance sector towards the goal of enabling the poor throughout the developing world to access credit for self-employment as a poverty alleviation strategy. We have served over 120 microfinance institutions (MFIs) in 50 countries over the last decade, with $215.5 million in capital benefitting as many as 2.8 million poor entrepreneurs. While India is one of the largest potential markets for microfinance, Deutsche Bank currently does not have any loans to microfinance institutions there due to the rapid commercialization of the sector and concerns with pricing of the loans to poor clients. Deutsche Bank is not active in the microfinance sector as a commercial activity to realize financial gains for the bank. However, Deutsche Bank recognizes that the success of microfinance depends upon its ability to utilize business discipline and financial techniques to achieve the goal of scale and sustainability in serving the financial needs of the un-banked poor. Deutsche Bank has developed social scorecards through which it judges the social intentions and the extent of social framework of MFIs in its underwriting. Deutsche Bank's MFI clients must meet standards of good governance, transparency, and interest rates that are reasonable within the country and regional context. a) In early 2008, Deutsche Bank gathered industry leaders including CEOs of MFIs, academics, rating agencies, development banks, and thought leaders to discuss the challenges facing the microfinance industry with increased purely commercial investors entering the market. This roundtable discussion led to the Pocantico Declaration, which was an important historic moment in the history of microfinance, providing clarity of intentions and values for the sector in being committed to the interests of the poor. 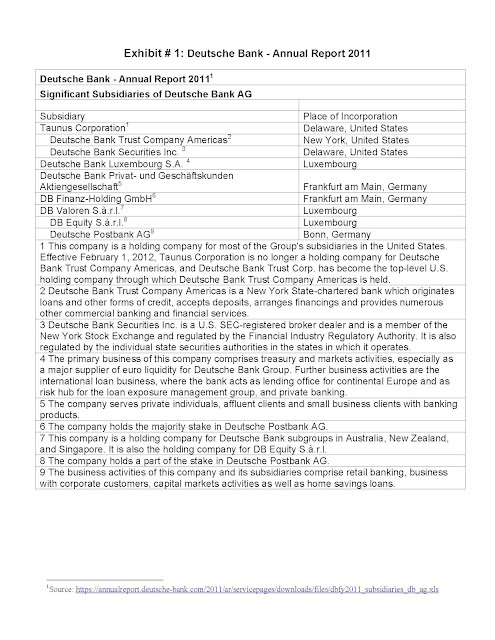 b) Following the Pocantico Declaration, Deutsche Bank was the early funder and one of the architects of the SMART Campaign, which focused on protecting the interests of microfinance clients by making sure that poor borrowers were not over-indebted, that there was transparency of pricing, that collection methods were not excessive, and that clients were treated fairly. c) In November, 2010 Deutsche Bank organized a roundtable and brainstorming session on the potential risk of multiple borrowing and over-indebtedness with in-country microfinance networks, development banks / agencies, and philanthropists. d) In partnership with Moody’s and leading universities such as NYU and Yale, Deutsche Bank initiated the idea and organized a large conference at its headquarters in America where a discussion of the social impact and innovation of microfinance took place. e) In 2011, DB convened a meeting in New York with eight CEOs of the leading microfinance networks to discuss challenges with a view to forming an association that can collectively address issues faced by the Industry. The unprecedented meeting resulted in the formation of the Microfinance CEO Working Group comprised of industry leaders from ACCION, FINCA, and Pro Mujer, among others. Subsequently, the Group released a report “Road Map for the Microfinance Industry: Focusing on Responsible and Client-Centered Microfinance” which addresses responsibility and development of client services and products. With more than half of the world’s population living on less than two dollars a day, there is an urgent need to alleviate poverty. Microfinance is a business approach to helping the poor build their way out of poverty, by providing the poor access to financial services, namely credit and a safe place for their savings. Microcredit, the extension of very small loans (microloans) to poor and low-income entrepreneurs who cannot access local traditional funding due to a lack of collateral, or a credit history, has proven to be a revolutionary model for enabling the poor to rise from poverty. To summarize, whether it is the present untimely (huge) investment in SKS (an MFI under fire from the regulator and having increasing ghost clients/frauds as per its own admittance) to supporting the illegal operations of LAPO[x] (Nigeria) some years ago and attempting to cover up the same (Mr Asad Mahmood tried to do so as per Hugh Sinclair’s book and related communication)[xi], Deutsche Bank has an immense amount of explaining to do. And going by the same transparency principle (that Deutsche Bank claims to have helped create for MFIs), it is time that Deutsche Bank comes clean on its global micro-finance investment story! Let us be clear on that! a. Why did Deutsche Bank invest in SKS at a time when even the regulator (Chairperson, IRDA) saw massive problems with its (insurance) operations? 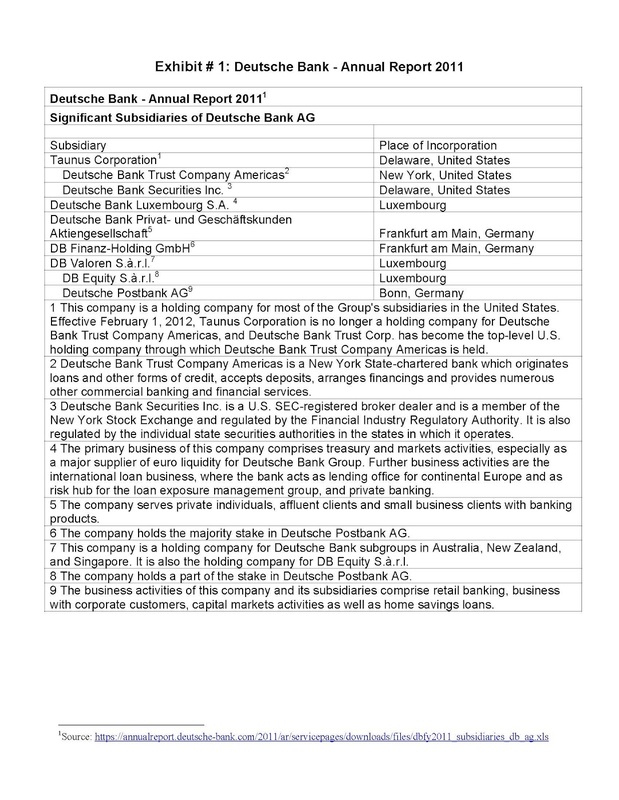 d. The Deutsche Bank website notes that, “Deutsche Bank's MFI clients must meet standards of good governance, transparency, and interest rates that are reasonable within the country and regional context.” If that was the norm, then, how did Deutsche Bank invest in LAPO (Nigeria), which, according to public domain information, suffered from several weaknesses including: a) illegal collection and intermediation of savings; b) inordinately high (effective) interest rates touching 144% under specific situations; c) an illegal loan product (perhaps) because illegal savings collection was a part of it; d) conflict of interest in terms of the auditor being related to the CEO and other such issues; e) high levels of client desertion; f) lack of transparency with regard to data (which led to MicroRate’s subsequent withdrawal of its rating); and g) poor governance among other things. e. Who coordinates the various Deutsche Bank investments in micro-finance? According to their focus magazine, it is the community development finance group (CDFG) that coordinates this! If so, how did the CDFG recommend SKS Microfinance despite the various on-going problems? At least, should not have Deutsche Bank waited until the enquiry by the regulator was over? f. And last but not the least, why did the same Deutsche Securities Mauritius Limited sell of its stake in SKS Microfinance just a few months ago (according to the Economic Times[xiv] as well as filings with the BSE) and then again buy back SKS Microfinance shares? Something peculiar is happening here! [i] Does Sinclair’s Open Challenge (to the Global Micro-Finance Industry) Make His Claims True? and Hugh Sinclair's Response to My Earlier Post - "Does Sinclair’s Open Challenge (to the Global Micro-Finance Industry) Make His Claims True?" [vii] Source: Quoted from http://www.moneylife.in/article/sks-microfinance-employees-swindle-rs158-crore/27247.html. The Moneylife article was based on the SKS annual report and so, the annual report must have been released earlier than the date of the news item. [xi] Please see the following articles in this regard: Does Sinclair’s Open Challenge (to the Global Micro-Finance Industry) Make His Claims True? [xii] Please see the following articles in this regard: Does Sinclair’s Open Challenge (to the Global Micro-Finance Industry) Make His Claims True? Greed or incompetence? With Deutsche Bank, as usual, it is hard to tell. As a client I have long been appalled by its failure to divest from firms engaged in the production of land mines or cluster bombs (e.g. http://www.thelocal.de/national/20110518-35103.html). So one wonders whether DB is investing in the most dubious of Indian MFIs in the hope of SKS retaining its market leader position, and soon reaping returns again; or whether it is a naive step, unaware of SKS' troubles. This, presumably, only an inquiry into the internal decisions could reveal.